Aleene's Paper Glaze is great for card embellishment and it is perfect for achieving dimensional designs and laminating on paper. Aleene's Paper Glaze adds a clear dimensional layer to paper designs including simple line work and larger areas. Paper Glaze dries to a hard, non-tacky glass-like finish which accentuates design details. Paper Glaze can be used alone or tinted with acrylic paints. It won't run colors and it can be accented with a variety of embellishments including microbeads, glitter and trims. 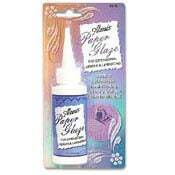 Paper Glaze comes packaged with a convenient needle-nose tip for precise application. For broader area application it can be brushed on. Contains 2 oz.